The eEye Retina Community is a free vulnerability scanner that identifies vulnerabilities. The software comes from eEye Digital Security. 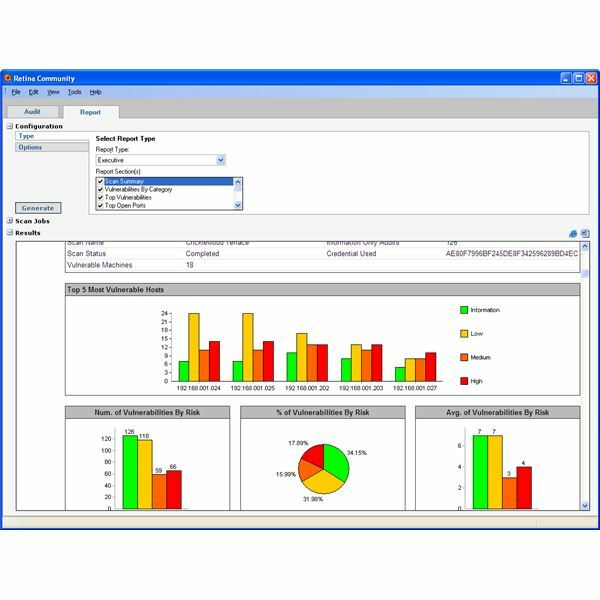 It is a vulnerability management software that is suitable for any business or industry in need of endpoint protection and a secure configuration compliance. Overall score: Thumbs up. The eEye Retina is a prominent product that will provide "zero-day vulnerability identification." "With Retina Community, enterprises and SMBs can strengthen security and compliance posture"
Note: In addition to the eEye Retina Community, the company has other Retina products (which are not free): Retina Consulting, Retina Network, and Retina CS Management, so it may best to compare them to see which one is most suitable for your environment. Advice: Check out the latest information on eEye Retina from eEye Digital Security's own Community Forum at https://forums.eeye.com. 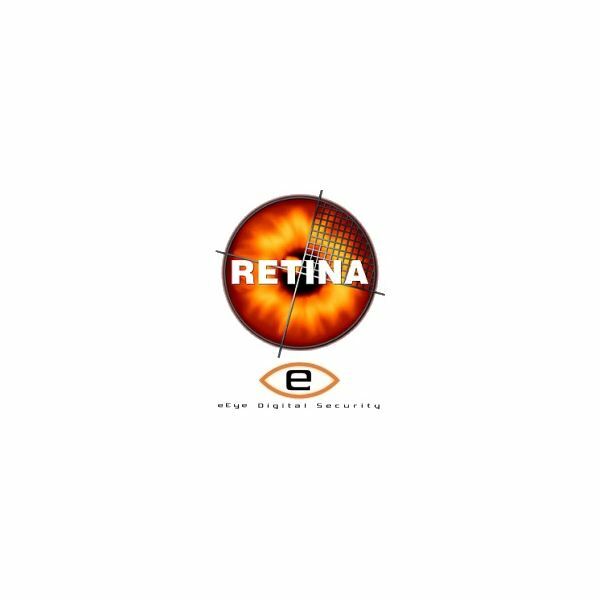 Retina is a certified security assessment tool by eEye Digital Security. Research shows that many security conscious organizations as well as government agencies use the Retina products when employing network security solutions. Prospective users can download the free tool powered by eEye from the Retina Community website. Note: To activate the product, users must provide a valid email address. Also available for downloading at the eEye Retina Web site are the other "Vulnerability Management, Network, and Consulting Solutions" for a trial period. You may want to compare each product to see which one is more suitable for your needs before downloading. Alternatively, request access to all the eEye video demos. Installation of the free eEye Retina scanner is quick and easy. There will be a RetinaSetup.exe file that will do the installing of the product. The minimum requirements for the install is 80MB of Free Hard Drive Space and 512 MB RAM. This free scanner can only be used on Windows: 2000/XP/2003/Vista SP2/2008 SP2/7/2008 R2. Retina can be configured to scan one IP address or a domain. Users will receive regular vulnerability updates. According to reviews from SC Magazine, the eEye Digital Security Retina performs very well. Once setup, management and scanning is done through the Retina application and can be controlled with REM, eEye's central management console for complete threat coverage. The Retina is easy-to-operate on PCs. It is capable of providing a scalable vulnerability assessment for any size network environment. Note: There is also an Eye Digital Security Pocket WiFi Retina Scanner too for the wireless community. The eEye scans for malicious activities on a system. Users can rely on the product's Wizard for a brief introduction to how it will perform a vulnerability scan. To begin a scan, simply enter in an IP address or a domain in the address window. Once the scan is complete, users can then analyze the results of the information and details for the address(es). 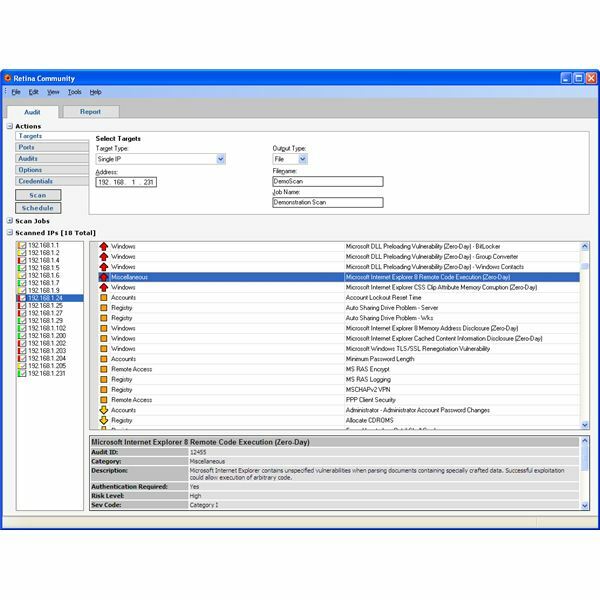 Note: The free eEye vulnerability assessment scanner can provide reliable protection against the Conflicker worm as well as target other threats. It can be downloaded at https://www.eeye.com/html/downloads/other/ConfickerScanner.html. The eEye Retina is an average rated functional vulnerability scanner. It is suitable for those users who do not have the MS08-067 patch and for those that want to try a product capable of scanning and reporting vulnerabilities. Price-wise, the eEye retina Community is, of course, available at a good price (free), and the other Retina products may be of value to users as well (depending on how much they want to spend). But, compared to other free vulnerability scanners (like the Shadow Security Scanner and Nessus) the Retina is less favorable to some users (as shown by SecTools.org's "Top 10 Vulnerability Scanners"), but it is still among one of the top picks for Windows platform users. eEye Digital Security. U.S. Department of Defense Chooses eEye Digital Security for Vulnerability Management Solution. PRWeb. eEye Releases Free Vulnerability Scanner with Zero Day Identification and Configuration Auditing.